Alain Monroy graduated from the University of Nevada Las Vegas with a B.A. in Political Science and commissioned through Army ROTC as a Field Artillery Officer in 2009. Alain served 5 years with the 82nd Airborne Division out of Fort Bragg, NC and 2 years with the 25th Infantry Division out of Schofield Barracks, HI. Alain is a graduate of the Basic and Advanced Field Artillery Officer Courses, Ranger, Airborne and Air Assault Schools. 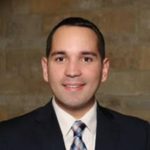 Alain is currently a member of the JPMorgan Chase Military Officer Executive Development Program as a Commercial Banker in Phoenix, AZ and will pursue an Executive MBA at the W.P. Carey School of Business – Arizona State University.